Are you looking for the perfect costume to show everyone how much you love the United States of America? Well, that’s easy. 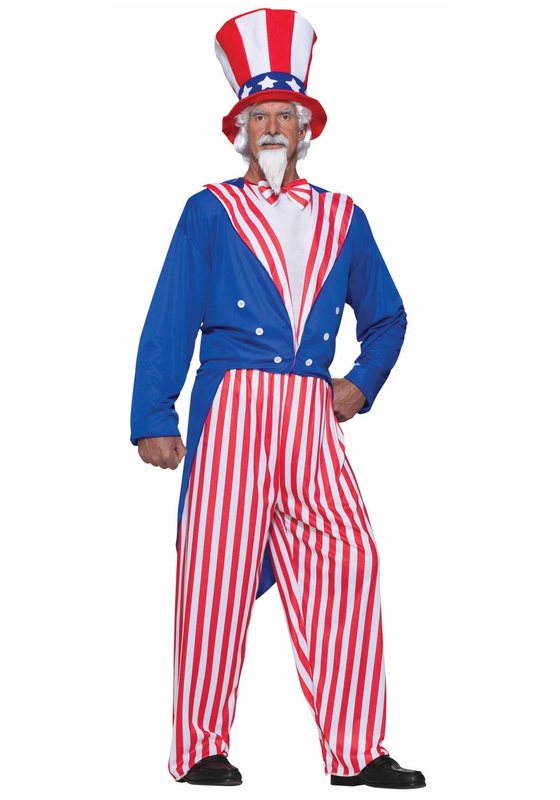 You can have more national pride than anyone else in the streets this Halloween or 4th of July, when you toss on this amazing Uncle Sam Costume! You can proudly preach to everyone about the pride you have in your country and the hope you have for its people. Make a most patriotic transformation this year when you toss on this vibrant blue jacket and slip into the red and white striped pants. Add the matching striped bow tie and the striped and star-spangled top hat, and you’ll be quite the sight to see. It will look as if an American flag was possessed by the American spirit and took the shape of a man! Then once you grab a white wig and a matching beard and mustache kit everyone will recognize you as, the one and only, Uncle Sam. Everyone will be yelling, “I want YOU… at my party” when they see you in this attention-grabbing costume. Not that it’s your responsibility to do so but a lot of people might expect you to be able to command a flock of eagles should they happen to fly by… so be ready for that. Toss on this Plus Size Uncle Sam Costume and be the most patriotic thing anyone sees all day. Get a whole party to break out into the National Anthem and make the night one for the history books!